We’ve had first-hand experience working with not-for-profit organisations, looking to refurbish dated or lacklustre workspaces with the aim of reinforcing their brand identity and message, and promoting a positive environment for their workforce. The overriding objective is to create productive spaces that help create a brand-appropriate and inspirational base for the charities’ main objectives – to raise awareness and funds for the core beneficiaries. At CCWS, we’re firm advocates of the notion that inspirational office design is directly associated with staff morale, productivity and creativity, which in turn equals results! This can only be a positive thing for any company, especially charitable foundations. 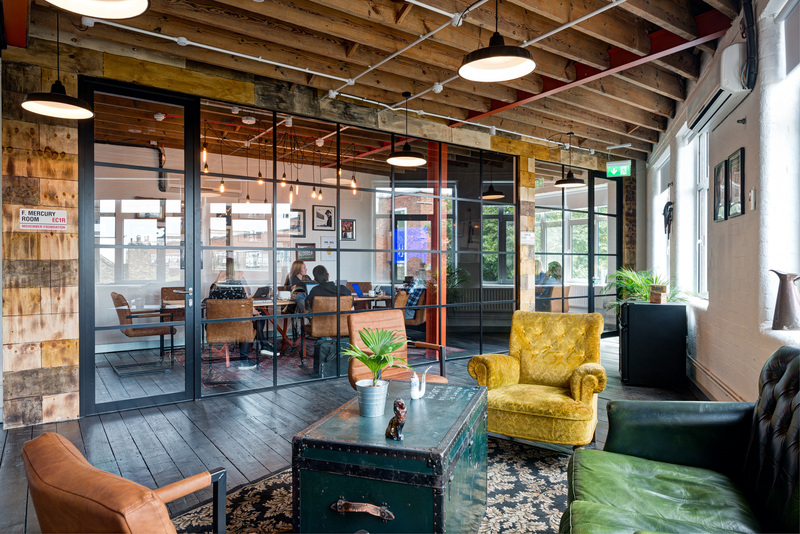 When looking to redesign its London head office, the global men’s health charity, Movember Foundation appointed CCWS Interiors to undertake the office design and refurbishment. Having worked with them on their previous office refit, we jumped at the opportunity to bring a new lease of life to this awesome charity’s London HQ. 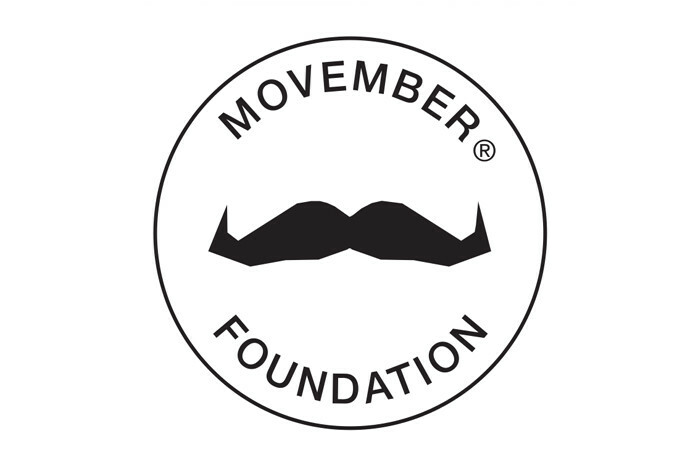 Located in the creative district of Farringdon, nestled amongst art galleries and buzzing eateries and bars, the 6,000 sq ft space is the ‘beating heart’ of this world-renowned charity; a hub for the Movember workforce to collaborate, initiate and implement its objective to bring men’s health to the forefront of the public conversation. We were tasked to transform the open-plan office into an inspirational environment that reflected the ethos and brand identity of the organisation. The brief was set to upgrade the office design and create an environment that better matched the people, brand and culture behind Movember. Providing a base for both local and visiting international teams, the newly-configured office needed to easily ‘expand-and-contract’ as required during busy campaign periods. Over six weeks, we delivered flexible workspaces, hot desks and hot-booth-meeting areas to encourage collaboration and introduce both formal and flexible productivity areas. 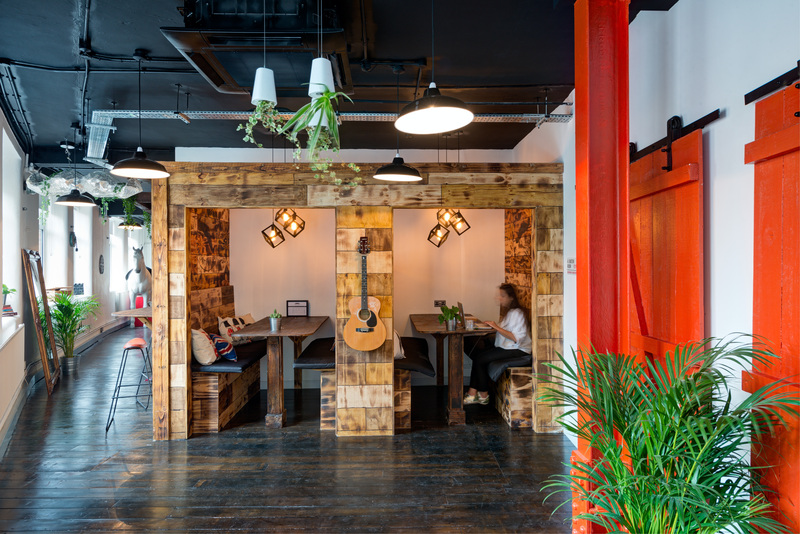 The traditional concept of ‘one desk, one employee’ was thrown out in favour of this interactive co-working model, whilst also catering to introspective work styles with semi-enclosed booths. 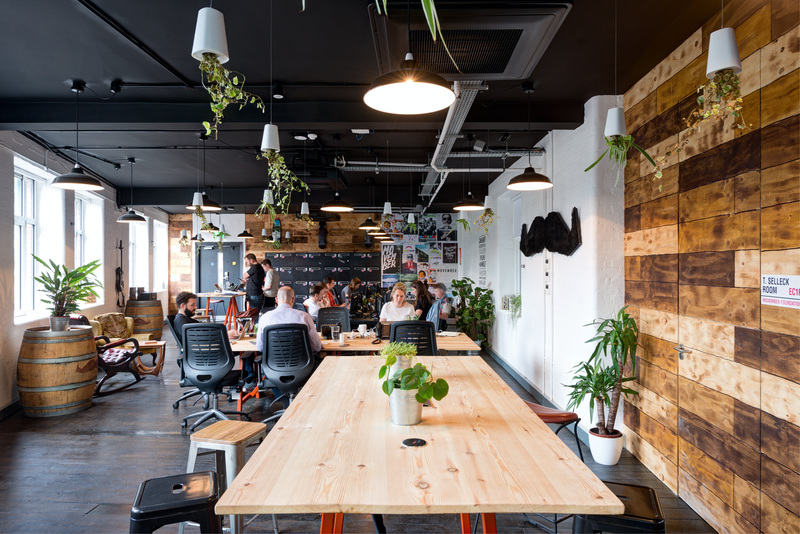 When looking to the office interior, the refit was characterised by industrial design elements, seen in the use of rustic wood cladding and exposed metal fixtures, alongside playful detailing throughout and the company’s signature ‘moustache’ symbol displayed with pride. As with all of our projects, it’s all about the attention to detail. When adding the final touches to the Movember office design, we collaborated with the Movember team to introduce some famous moustache owners to the office décor; fancy a catch up in the Chaplin, Mercury or Einstein room? In order to deliver an office space that reflected and supported the underlying culture of Movember, we readily embraced the identity behind the not-for-profit organisation. Over the last 15 years, the charity has raised over £540 million for men’s health. In 2017, £8 million was raised for the cause in the UK alone, 69.7% of which was allocated directly to men’s health projects. Turning around this project in a short space of time meant that we were able to keep to the company’s fixed budget, a brief that is essential to the reported outgoings of any charity.